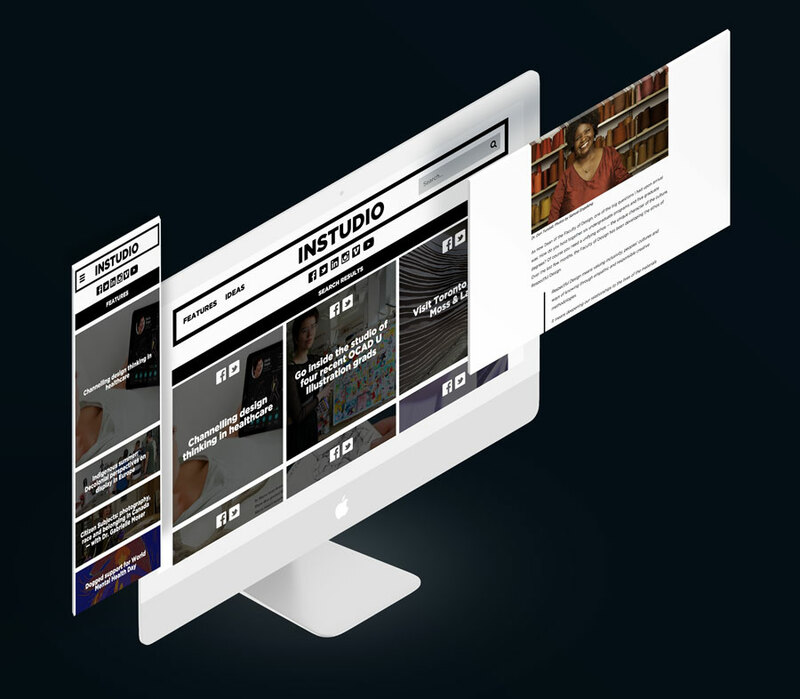 InStudio is a online publication platform — not a digital magazine — focusing on art and design discourse and fast moving ideas on art, design and new media. The platform divides content into two verticals; features, which focus on longer form content and research, and ideas, which focus on shorter, faster moving, content. While the platform stands on its own, it lives within the OCAD University brand and acts as a content funnel into a variety of other systems. Built in collaboration with Toronto design studio Hambly and Woolley, the platform is tightly integrated into the OCAD U brand and content syndication ecosystem through various APIs and 3rd party integrations. The platform also serves as one of the main entry points into the University CRM for prospective students. Architecture and information flow of InStudio within the OCAD U ecosystem. This project, built on top of a Drupal 7 backend, is a decoupled API-First application. This approach was chosen to provide the most flexibility with the front end, as well as to allow easy syndication across the OCAD ecosystem. One of the primary requirements for this project was that all content must be on a publish once, distribute everywhere model where an article could be contributed and simultaneously appear in email marketing, custom feeds across the OCAD U program pages, digital signage, mobile apps, etc. All of these locations must be targeted and customized for their locations, audiences, etc. In keeping with the content verticals, InStudio focuses on two main groups: prospective students and practicing artists/designers/makers. Both groups have similar usability goals, but due to the differences in content, were treated separately to ensure content is delivered efficiently. As someone interested in art, design and digital media, I want to see the latest and greatest in the community. While I am very interested, I want something casual and easy to consume and share that doesn’t feel like homework. If something is interesting enough, I may read an article, but and more interested in great images, video and shorter form content about or from the OCAD community. As someone who practices art, design or is a maker, I am interested in thought leadership and deep dives into art, culture and media. I’m looking for something substantial and reliable that I can share with other professionals and am not worried about OCAD specific content. I’m looking for well researched content with great visuals that show off the richness of our professional space.